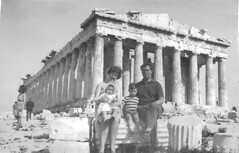 Have the same photo – Mom Dad (10 pound poms) & 3 kids at the Acropolis. Let Southhampton March 17 1967 (aged 14) aboard the Ellinis – arrived and stayed in WA 5 weeks later. Very much enjoyed this 10 poun pom page.